A comparison I often hear is that current day Walla Walla Valley resembles Napa Valley in the 1970s. There are, in fact, numerous parallels. There is a spirit of cooperation in Walla Walla that is said to have marked Napa during this time. Additionally, there is an almost continual influx of talent and aspiration. There is also, of course, explosive growth. One this is clear though. Walla Walla Valley will never become Napa Valley. Here is why. Napa has a built-in tourist industry that Walla Walla will never have. Napa receives 4.7 million visitors annually. Over three million of these people are making day trips. Day trips are easy with about seven million people living in the Bay Area, about an hour and a half from Napa. Conversely, about 459,000 people visit the Walla Walla Valley each year with about forty percent of these people making day trips (Note: numbers from 2008). 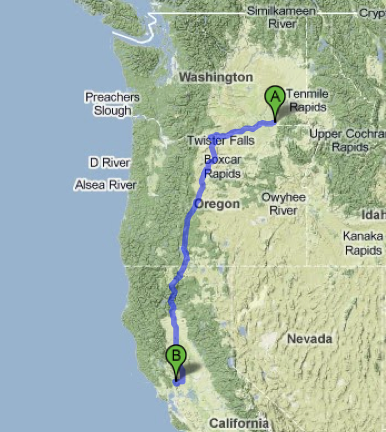 The two largest population centers near Walla Walla are Portland and Seattle, both a little over four hours away. These two cities combined are smaller than the population of the Bay Area. For people visiting the Walla Walla Valley from these cities, day trips are almost out of the question making it a weekend endeavor (the average stay for overnighters is 2.8 days). This is, of course, what gives the area much of its charm and appeal. While additional air travel to the area could increase visitation, this will never be the same as having a large metropolitan area within close proximity. There are numerous other differences. Like most of Washington, Walla Walla is notable for its many small producers and few large ones. Napa, in contrast, has numerous mid to large-size wineries. Interestingly, both Walla Walla in Napa are home to a large number of their respective states’ wineries (1/5 for Walla Walla and 1/4 for Napa) but account for a very small percentage of total state production. The differences in production between the two areas are substantial. The vast majority of Walla Walla wineries make less than four thousand cases of wine annually. This is less than many Napa wineries make of any single wine. One of my favorite examples of this comes from Napa Valley’s Joseph Phelps. Cabernet is king in Napa Valley and few do a finer job with it year in and year out than Joseph Phelps. The winery’s flagship bottling is the ‘Insignia’ which comes in at a cool $200 per bottle. The winery produces almost seventeen thousand cases of this wine alone. Think about those numbers for a moment. While Walla Walla has new wineries coming on-line with each passing year and numerous grand projects are in the work, the valley will, most likely, never produce wine on the scale that Napa does. I will never say never because there is a lot of land there but it seems unlikely, although there will certainly be more mid-size wineries in the coming years. Overall, Napa Valley and its growth over the last forty-years can provide instruction to Walla Walla Valley. There are comparisons to be made. But ultimately Walla Walla will never be like Napa Valley, nor should it be. Walla Walla is on its own unique path as a wine region. Only time will tell where it goes. Note: See a recent post from Josh at DrinkNectar.com that includes some related discussion. Um, so where do you think Walla Walla's path as a wine region will be in 2015? If history is a lesson, then I would expect some consolidation, mergers, and attrition...but that's like using a 'fatman' bomb to catch fish. I totally agree with the proximity piece. Unless we move a big city closer to Walla2, it will never be Napa. Spokane boasts 3.8 million visitors annualy but will always lack the romance of the vineyards. Woodinville has decidedly made a play to be region #1 in the state, but city planners have a lot on their plate to make sure it retains some charm rather than becoming a suburban nightmare. 2015? I'm not an expert (in anything really) but I don't see much attrition but could see some consolidation happening there. Growth will continue and that region could see 750,000 visitors annually if it focuses on its infrastructure. WWM, good question. It will be interesting to see what effect the economy and the opening of so many tasting rooms in Woodinville has on the area. I don't think consolidation, mergers, and attrition are out of the question. There are a number of wineries sitting on a whole lot of wine. I do think there will continue to be new wineries opening up as well. Josh, those are pretty impressive numbers for Spokane actually. Time to start planting more there! :) I agree that city planners have their work cut out in Woodinville. Just had a long discussion with somebody about this last night. It could really go one way - or the other - with all of the growth. We'll see. Right. I cannot tell you how many times I have stamped my feet, yelled at anybody who would listen to me, cringed when some enthusiastic writer from LA or NY (who has never actually visited Walla Walla)thought they cleverly coined that phrase and several times myself blogged, "Walla Walla will never be another Napa!" Due to the fact that we are too far away from anything major - and thank goodness for that! Catie, mercifully, it is a LONG limo drive from Seattle! Keep fighting the good fight. I think the other thing that is frustrating is people assume Walla Walla actually wants to be another Napa. The truth is, we don't. We are quite happy where we are in the wine world, thank you very much. Napa makes car parts. Walla Walla makes wine. Apologies to Tommy Smothers for Catie's Napa joke, but I agree with everything said. Walla Walla doesn't want to be Napa any more than Washington wants to be California. The value of WW is its uniqueness. (On the other hand, WW wineries and merchants probably wouldn't turn down any additional wine tourist dollars...) I do hope, however, that the WWVWA continues its efforts to spread the WW Gospel nationwide. When I visit accounts in Boston, Chicago, Jersey - and even Denver - I'm amazed at the continuing lack of awareness of small WW and WA wineries. There's no reason to want to be big right away, but we can't sit around and wait for people (thank you wine bloggers) to come to us; we need to be proactive to spread the word. Rusty, very good points. Whenever I travel I always stop by wine stores to see what Washington wine they have on the shelves. Often it's just the usual suspects from the state's larger producers. This is a good start but it's equally important to make wines from smaller producers more accessible to people in far flung areas. A difficult but critical problem to solve. One thing that will give Walla Walla and the State of Washington some mileage was the Wine Bloggers Conference. Hopefully, we can continue to procure such events that will give us consumer awareness. Rusty, that isn't my joke. Been around for awhile. Catie, I agree which was part of the reason why I, personally, saw the bloggers conference as important. Creating a strong group of evangelists for Washington wine, let alone people who are active bloggers, and sending them forth could have a significant impact over time. Just returned from a short wine tour into Sonoma and Russian River Valley – almost without exception when we mentioned being from Washington and Washington wines, the tasting room staff would say – yes, you are making some good Pinots up there.. What???? We’ve got a ways to go my friends…..
A couple of years ago the cry of "don't Bend Walla Walla " was taken up. There seemed to be more of a fear of becoming another Bend OR which may be closer comparison of what W2 may become in the future. Bend is regionally isolated but brought an eclectic mix into its fold and has prospered as a hip place to be/visit. I think that W2 will continue to attract people to a lifestyle that will play to its strengths, which it will need to support the expanding economy that has sprung up lead by the wine industry. No doubt the economic downturn has slowed this and will change the landscape of what wineries survive or merge but in the long run there will be growth and in due time the region will be recognized for the excellent quality of wines it produces. When that happens at least we can say "I remember when..."
Jan, I've also heard that Pinot comment. Ouch! I've said numerous times - I think people think I'm kidding - that Washington continues to have an awareness problem outside of people paying a lot of attention to wine. In many cases, at best, they hear about it but don't see the wines they hear about on the shelves. It's a problem. Anon 8:20am, very interesting comparison regarding Bend. I should say that, while I believe Walla Walla won't become Napa, it will obviously be changed by the wine industry there. It already has been of course. Whenever something is gained, something is also lost too. Personally, I hope Walla Walla always retains what makes it special. As an outsider, I believe, perhaps naively, that it will. However, I'm sure there are people who think it's already changed for the worse in some ways. Many folks don't like change, although it's about the only constant. Thanks for the comment. There was more to the "Don't Bend Walla Walla" story that forced that cry - alot more. A developer from Bend Oregon came to Walla Walla and wanted to build "Illahee," a 365-home upscale development complete with golf course, a 60-room hotel, 10 miles of trails and a restaurant. Actually, the concept,or a concept like this, would have been great for Walla Walla's economy as the Port of Walla Walla just announced if we want growth of retail, especially chain stores and dining establishments (many locals want a Granny's Buffet, Olive Garden, Costco, et al "sigh") we need more "roofs' sold. We need to expand our population. However, the problem with the Illahee idea was they wanted to sneak in on the coveted rural water, plant themselves on nearly 360-acres of pristine Walla Walla farmland (Sean, the area was near K-Vintners house/tasting room) and the new structures would hide one of our best panoramic views of the Blue Mountains. Push came to shove and the county commissioners sent the Bend group back to Oregon. Walla Walla is a funny little town and has always been this way. We want growth, but not too much, especially if it means we have to change things. Believe it or not, there are several Walla Walla citizens who hate-hate-hate the wine industry and feel that everything wrong with the city, the wineries are responsible and should be made to fix the problems. Of course, those of us who paid attention in economics and social studies classes know better. And no - I am not one of the citizens who want a Granny's Buffet, let alone an Olive Garden. Catie, thanks for the context. As I was reading your comment I thought "Hmmm...that could have been really good for the area in some ways" and then when I read about where it was going to be I was appalled. Very difficult to get the balance right. I am sure there are many in Walla Walla who are not pleased that the wine industry has grown there. We need to give them a 'Christmas Carol' view of what the area would look like without it, although I guess they might like it! Tri-cities? There is a commercial airport and a mid-size metropolitan base. Did we forget about this? It's only 45 minutes away for those who don't know. The Tri-cities airport is definitely a good option for flying in to Walla Walla. Can't compete with people's ability to take a direct flight to SFO/Oakland/San Jose but also gets people closer than those points - although you can fly in closer to Napa as well. I was pleased to see that about 1/3 of visits to Walla Walla were from day trippers. I'm assuming many of those are from the Tri-cities. Still, with a population of about 235k for the metro area (2008 census numbers), the population is quite small compared to the Bay Area. late to the game on this one, but sean you're exactly right - walla walla doesn't have a major metropolitan area within 45 minutes like napa and, thus, will never, ever be a napa. but, that's also what i love about walla walla. in fact, i bet i know more people in seattle who have been to napa than have been to walla walla. good write-up. I'm late to this discussion, too. I concur with just about all that was said. I have written a blog in my Review of Washington Wines about this topic, with quotes from the comments. The inherent charm of WW is its eclectic mix of wine people, academics, farmers and artists, along with small town ambience and the majestic Blues. That is WW's biggest asset and future growth needs to be built on that. Oh, about the lack of proximity to Seattle, Portland and other cities, hey, Alaska/Horizon Air where are the Air/Lodging/Car Rental packages for Walla Walla?!! Hi Rand, never too late! Thanks for the thoughts and also for mentioning this on your blog. I agree that I would love to see more package options for traveling to Walla Walla. I live in the bay area in california and like going to Napa about 4 times a year. I only live about and hour away. It is very easy for me to get there. This year my wife an I were going to go to Walla Walla, but chose to go to Paso Robles which is getting very popular to go to if you are from LA or SF. It is about 3 hours away. The wines are different than Napa, but the quality is getting very good, and the price point is great. I kind of see Walla Walla to Seattle and Portland as Paso is to LA and SF. They are making very good wines, cheap to taste, and to stay. Napa is very expensive to visit, taste, or buy. ($500/night, $25 to taste, $100 abottle) I drink more Washington wines than California wine because I like the blend style and the price for quality is great. I can spend $75 on a Corliss or Leonetti which is on the high end of Washington price point for a very good wine to hold. There are so many good wines from Washington for $40 and under that I get better bang for the buck. In the Bay area there are a lot of stores that sell Washington wine, and not just the big producers. I can sometimes find things that are sold out on the winery website in stores here. Yesterday I found a bookwalter that was sold out online in a store here. Restraunts are also selling a lot of Washington wines. Napa is fun, but maybe you don't want to be Napa. You will be priced out of all the fun. Anon Sept 17, interesting comparison between Paso and Walla Walla and glad to hear that Washington wines are seeing good penetration in the market in the Bay Area. I agree that the QPR for the Washington wines - especially compared to Napa - is quite high. Thanks for the comment!